If you would like to be listened to, as well as cared for, then you will find that our practice is worth investigating. 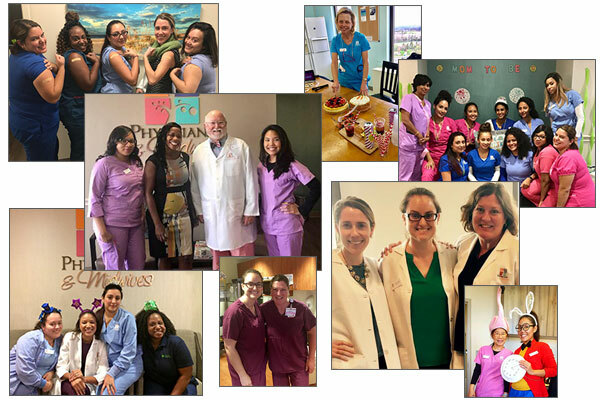 The Physician and Midwife Collaborative Practice is made up of physicians, midwives, and nurse practitioners who specialize in providing obstetrical and gynecological care and practice in five centers spread out across Northern Virginia (Alexandria, North Arlington, Mt. Vernon, Kingstowne and Woodbridge), all the offices are connected by a state of the art Electronic Medical Record. We understand that our patients are time sensitive and our office hours and locations are in place to stress convenience. In addition, our dedicated call center is in place during office hours to facilitate your requests for medication refills, lab results or questions about your treatment. Physicians and Midwives is a unique collaborative practice you won’t find anywhere else. We began the system now called “Physicians and Midwives” in 1993 to fill what we believed to be a gap between what the patient expected and desired from her doctors and what she commonly received. People are living longer, more productive lives, and fewer babies die due to prematurity. Much of this progress has been made due to the development of new medicines and the application of new technology. At the same time, a certain depersonalization of medical care seems to have taken place. Why in an era of medical miracles are the patients apparently less satisfied with their caregivers? We believe that, whether you are a woman seeking advice about what could be your first sexual encounter, a woman in the prime of her reproductive years, a woman in that transition time of her life, or a woman dealing with senior issues, you deserve a compassionate, as well as knowledgeable, caregiver who has the time and inclination to offer advice and support, as well as the latest in modern tests and medicines. Our prenatal care focuses on education and empathy, as well as blood tests and sonograms. Remember, most pregnancies are normal. In a given office visit, you may see one of our doctors or one of the midwives. Our physicians, midwives, and nurse practitioners are experts on the best ways to deal with the changes in your body, as well as the impending changes in your life. If a disease develops, the providers, as a team, pursue optimum management. Each patient in labor is cared for by both an obstetrician and a midwife. We believe that more human support in labor leads to a better pregnancy outcome. Our gynecologic practice looks at the complete woman. We think that a woman is more than the sum of her reproductive parts. We believe that medications and surgery can be sustaining and life giving, but without a complete understanding of your condition, medicines and/or surgery are useless, and moreover, at its worst, surgery without solid indications can be harmful. To schedule your annual Well-woman visit you can call our appointment operators (703-370-4300). or schedule your appointment online. We can screen for sexually transmitted diseases, treat vaginitis or menstrual irregularities, as well as prescribe contraception. We understand that our patients time is valuable and our office hours and locations are in place to ensure convenience. In addition, our dedicated call center is in place during office hours to facilitate your requests for medication refills, lab results, or questions about your treatment.